This is a story about an experience I had at a Christian cult. I was hitchhiking in eastern Pennsylvania back in April 1998 when this man and his son picked me up. When I got in the car, immediately, this guy gave me the creeps. I noticed a Bible on the dashboard, so I thought maybe he was a Christian. We got to talking and he asked me why I was hitchhiking. I told him that I was hitchhiking from Iowa to New York; I wanted to visit David Wilkerson’s church at 51st and Broadway in Manhattan. I am a Christian and love to read the Bible, but when we would talk about Scripture and the things of God, everything this guy said didn’t seem right—it didn’t bear witness with my spirit. So he said that he lived in a Christian community in Saugerties, New York—in the Catskill Mountains. He said that it would be all right if I wanted to stay the night and then hit the road the next day. It was okay by me. We drove to Saugerties to the “Christian community.” There were several buildings at the compound. There were probably 50 men, women and children. He showed me around the place and then this other guy showed me more of the place. I didn’t like being there right away. These little kids would walk up to me like little robots and say woodenly, “Welcome to our community. It is so nice that you are here.” Or words to that effect. It seemed like little canned speeches. I would meet adults and they would say the same thing. It was soon late afternoon and they had an evening fellowship meeting in the main building. It lasted maybe half an hour: singing, dancing, a little message from one of the leaders—the Spirit of Christianity was not there. It seemed so fake and artificial. The Presence of God was not there at all. It reminded me of a church back in Ames, Iowa that I used to go to back in 1987-1988—Great Commission Church—very cultish. For some reason, I noticed this guy on the other side of the room. You could tell that he hated being there: he would stay for a few minutes and then he would leave—he did this a few times. After the meeting, we went to the building where everybody dined. I sat down at this table and the guy who I noticed at the meeting sat across from me. He knew that I was the new guy in town, so he asked me a lot of questions about hitchhiking. He had never gone hitchhiking before, so I told him to put his trust in God and that the Lord would protect him on the road. He finished his meal before everybody else and shook my hand and shook my hand and shook my hand and smiled at me and thanked me for telling him about hitchhiking. He walked out of the building and on purpose walked by the window where I could see him and he smiled at me. At the time, I wondered why I was seeing this. After supper some of us sat down in the living room and I was surrounded by five people. They told me that they were the ONLY ONES doing the will of God and that I should stay there permanently. I told them that I had planned on staying one night and then I would head to New York City. I listened to their propaganda for at least three hours and then I went to bed. I didn’t sleep at all that night: I was on pins and needles. I told the Lord that I was in the pit of Hell and why did He put me here? I knew that God has everything under control, but I still wondered why I was at that cult. I stood there semi-shocked and said to myself, “Praise the Lord! That guy that I talked to last night escaped. Now I got to get out of here.” Why would that elder use the word ‘escape’? Man, what a flogging idiot. So after the morning meeting, I walked back to my dorm room and packed up my bag and walked out the front door. The guy who picked me up in Pennsylvania was waiting for me outside and started yelling at me, “Tim, what are you doing? !” He looked very concerned as if something was wrong with me. I said, “Well, you boys keep up the good work, but I’m hitting the road.” I even shook his hand; it was like shaking a limp piece of nothing. He was really ticked off that I was leaving. So I walked on down the road and eventually got rides all the way to New Hamburg, New York where I took a train into Manhattan. A few days ago, I had a dream where I was at this house with some friends. Then President George W. Bush arrived and sat down. I talked with President Bush for a short while. I do not remember what we were talking about. Last night I had a dream where I was on this ship. It was docked just outside New York. I was below decks sitting with around 50 U.S. Navy SEALs. We were eating sandwiches and talking. Then I went to the top deck and there were people sitting in folding chairs. 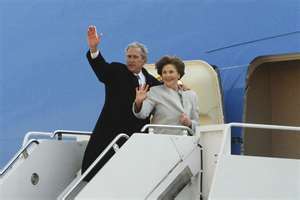 Then I saw Laura Bush. I sat down next to her and we began talking. I asked Mrs. Bush how far it was from New York to Washington, D.C. I told her that I guessed it was around 100 miles. I don’t remember what she said. Tagged with Dream, George W. Bush, Laura Bush, New York, Politics, U.S. Navy SEALs, United States, Washington D.C.